Content: It’s written for a slightly older audience, maybe 4th grade and up. It would be in the middle grade biography section if we had it in the bookstore. Since everyone knows all about Lincoln — seriously: I didn’t learn anything new — I’m just going to stick with my impressions here. 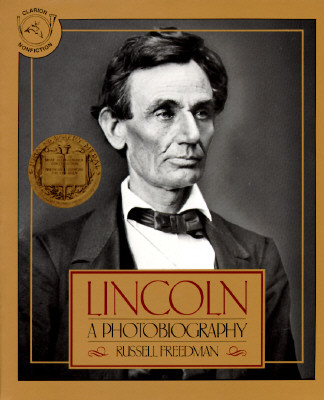 First: I’m not sure why it’s called “A Photobiography”, unless — and this may be the case — biographies before this didn’t include pictures and documents. BUT, everything I’ve read that’s come out recently pretty much follows this format. So, if this was the first one, then I’m glad Freedman changed it! It makes for a much more interesting biography then just text, especially for kids. Second: this read a lot like Steve Sheinkin’s work. It was simply written, but not condescending to its readers, and included fascinating facts and information told in a way that would compel a kid to keep reading. It was a good, quick read, even if I didn’t learn anything.